Home News DILG Asec Epimaco Densing – Impeach VP Robredo for Betrayal of Public Trust, Economic Sabotage! 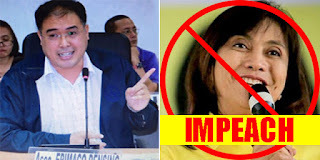 DILG Asec Epimaco Densing – Impeach VP Robredo for Betrayal of Public Trust, Economic Sabotage! Department of Interior and Local Government (DILG) Assistant Secretary Epimaco Densing III, in his Facebook post, he explained his proposal to impeach Vice President Leni Robredo after the an impeachment complaint filed against President Rodrigo Duterte. Asec Densing referring to Robredo’s video message which was shown during the annual meeting of the UN Commission on Narcotic Drugs in Vienna, Austria. Asec Densing noting only one-third or 2,50 out of the 7,000+deaths recorded by the Philippine National Police (PNP) are related to the drug trade. According to him, the VP did not mention that there were than 1.1 million surrenderers since the President took his office. Yesterday, our very own VP (though her election is still questionable), Leni Robredo, posted a video message which was intended to be shown today in the Annual meeting of the UN Commission on Narcotic Drugs in Vienna, Austria. She claimed of a "palit-ulo" scheme being done by the PNP and again mentioned the 7,000+ casualties in our government's anti-illegal drugs campaign. The claims are both untrue and unverified. She, being part of the government, should have asked the proper government agencies to verify her claims. The "palit-ulo" is an intelligence strategy to get information from small fish to catch the bigger fish in criminal activities. On the otherhand, of the 7,000+ deaths recorded by the PNP, only 2,500+ were deaths during police operations and on the balance, only 1/3 are related to the drug trade and the 2/3 due to various and unknown reasons which include among others grudge, riding in tandem, altercations and other reasons other than drugs. They've not mentioned that there were more than 1.1 Million surrenderers, including 80k pushers, and 48k arrests. The issue of illegal drugs is both an issue of law enforcement, as crimes have been committed due to drug use and trade, and rehabilitation. Both are being addressed by the current administration. I should know as I am privy to the information from the PNP and implementation of the drug rehabilitation program. What she has done should be the last straw. The VP and the rest of the opposition LP have been trying to destabilize our country by false propaganda via international media. They know for a fact that they have lost credibility among majority of the Filipinos. Their unverified allegations of human rights violations and so-called "ejk" which is non-existent have already taken its toll. We have lost a $434 Million (P20 Billion) grant from the Millennium Challeneg Corp which we could have been used for our anti-poverty programs; the European Union has threatened that we could lose at least 27 trade agreements because of alleged human rights issues (embedded in the trade agreements); and with her video message, without verification and challenge, could affect again our relationship with members of the UN. What she and her cohorts have been doing is tantamount to ECONOMIC SABOTAGE. It's time for the majority of the Filipinos to fight back and gain back our integrity from destabilizers. Section 2 Article XI must be invoked against a pretentious VP in Leni Robredo. She should be impeached for continuously attempting to sabotage our economy constituting "betrayal of public trust"! Impeach Leni Robredo!! We cannot trust a vice president who IS A LIAR! SHE IS DESTROYING THE COUNTRY'S IMAGE WITH HER LIES, I DO BELIEVE THAT WITH THE LATEST ACTION WHAT VP ROBREDO DID, SHE SHOWS INCOMPETENCE AND THAT SHE'S NOT FIT TO HOLD THE OFFICE OF THE VP. SHE IS A TRAITOR , AND DESTRUCTIVE! WHAT SHE'S DOING TELLING LIES AND SPECULATIONS TO THE UNITED NATIONS IS THE EVIDENCE THAT HER AMBITIONS AND POLITICAL AFFILIATION IS HER PRIORITY AND NOT THE COUNTRY'S WELFARE!